Griffin Sennett had a big two-RBI single to lift Miami Country Day. Griffin Sennett is the type of guy any ball player could learn from. The Miami Country Day catcher has worked very hard to crack the Spartans lineup and earn playing time. The sophomore has listened to what his coaches have told him he needs to do to improve, and he has put in the work. In Friday night’s HSBN Miami-Dade Game of the Week at DuBois Frazier Field against Ransom Everglades, Sennett rewarded his coaches for their continued faith in him. With a pair of runners on base in the bottom of the fourth, Sennett sent a blooper into shallow right field just out of reach of the defense to score both runners and take the lead. Reliever Juztin Gross then came in to close things on the mound, as the Spartans held on for a 3-2 victory. Country Day (6-10) splits the season series with Ransom Everglades, who won 3-1 in a February contest. Much like that previous meeting, it was a tight and exciting game from start to finish. The Raiders (5-8) broke a 1-1 tie to go ahead in the top of the fourth. Ryan Moralejo ignited his teammates with a two-out double to left field, then reaching third on a throwing error. Steven Vinson wasted little time in capitalizing on the scoring opportunity, jumping on a 0-1 offering by driving an RBI single past second base. Country Day responded right back with its next swings. Connor Goodman sent a high chopper to third to reach with a base hit, and then advanced to second on a passed ball. Jesse Grossman did his part with a great sacrifice bunt to move Goodman to third, and Juztin Gross was hit by a pitch and then stole second to give Sennett two ducks on the pond when he stepped into the batters box. 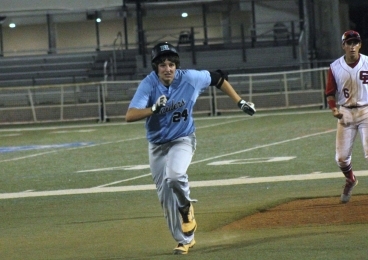 Raiders first baseman Ryan Morajelo heads for third base following his double in the fourth. Coaches typically remind their catchers that their primary duty is to work with the pitcher and execute that part of the game. It is a role all unto its own on the baseball field, and it always seems extra special when a catcher comes up with a big hit for his team. Sennett’s big hit turned the fortunes for starter Jose Oronoz, who picked up the victory. He struck out six, and Juztin Gross struck out another four while earning the save in relief. Ransom Manager Kenny Perez was satisfied with the effort from his guys, even despite the results. The Raiders played a clean and competitive game, not committing any errors while playing aggressive and having quality at bats. With a bit of time off now in store for the Raiders, the club is hoping the rest will help several key players to get healthy. The team proved it can play tough even without their missing guys, which lets them all know just how different they can be once those guys return. The Spartans Kian Andersen slaps a single up the middle in the fifth. 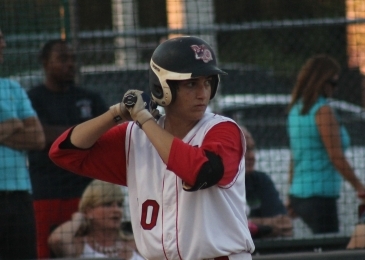 Vinson had a nice showing to lead the Raiders offense, going 2-for-2 and also reaching with a walk. After lining a leadoff single past the shortstop in the top of the third, Vinson gave his squad an early lead when he scored on an RBI single from Sam Bolduc. The Spartans answered right back in the bottom of the third. 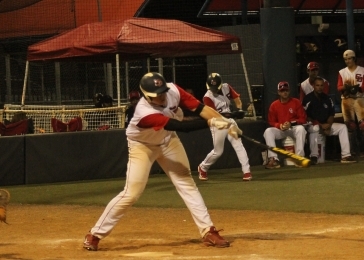 Sennett reached on an infield base hit, and Austin Pollack connected for the strongest hit of the night when he perfectly split the left-center field gap for an RBI double that allowed Sennett to score all the way from first base to even things back up. While the Raiders were able to muster base runners against Oronoz, the right-hander made the pitches he needed to in order to stay in control and put himself in line for the victory. Oronoz tossed four innings, surrendering two earned runs on five hits and two walks. Leave a comment using your facebook account!